Hi! How was your weekend? A brand new week means brand new projects to share. Today, I'm excited to share with you a card that I've made to join the Avery Elle Challenge. I've been wanting to join but I kept missing it. This challenge requires me to use a tag. I have not used a tag on my card in quite a while so I'm pretty excited to take up this challenge. I've used one of the most adorable sets ever called Storybook by Avery Elle. The tag is on dimensional adhesive and I've used the wreath to make a half circle. I've made my own banner to ground the tag. The balloons were added at a last minute because I thought that it needs more embellishing. I've adding some stickles to the balloons to give it some fun glittery interest. I hope you like it and check out this stamp set if you haven. I adore this set because I looooooove bunnies and it has the cutest little bunny on the set for me to use. Oh, this is just as sweet as can be. The balloon definitely added to your card and balanced everything out. So glad you were able to join us at the AEI♥U Challenge. Hope you can join us again next month! Oh my goodness - this is so stinkin' sweet!! I adore your clean and simple design! Beautiful coloring!! 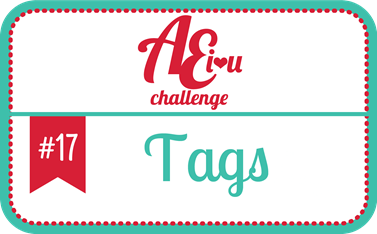 Thanks so much for joining us at the AEI♥U Challenge - we're so glad you did!! Gotta be a winner - great design.